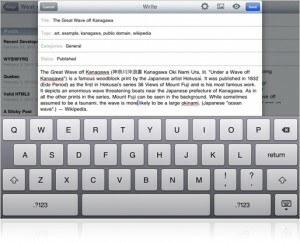 I wish I could tell you this is my first post composed on my new iPad, but its on-screen keyboard doesn’t come when I use WordPress 3.0 in the Safari browser. That’s just one example of things I can’t do on the iPad that I can on my netbooks, notebooks and tower PCs. Actually, I just found WordPress in the iPad App Store and with a couple tweaks, adapted my blog editor to the iPad. But going into WordPress straight through Safari was a bust. So this post was half-composed with the iPad and I am still figuring out details like embedding links and that sort of thing. Don’t get me wrong: there’s plenty to like about the iPad: it’s a great reader, photo and video viewer with a fantastic display, but to three decade PC vet like me, it feels quirky. And the tablet metaphor has some drawbacks. For instance, I recline using my netbook and notebook. With the display flipped up, I plunk the notebook down on my belly or chest and type with two hands. The tablet requires one hand to hold it up (it feels heavy at one pound, six ounces), leaving only one hand with which to peck away. For me, this is a downside of the tablet. I have this idea for a sling like device attached to the iPad and fastened to my forehead. That would free up my left hand for typing. Or I could really grow mountainous beer belly and lean it against that. No Adobe Flash on the iPad also means I can’t play my favorite Facebook game, Word Twist. And funneling everything through iTunes onto the iPad (save a the Camera Connection Kit, which my Apple store seems always out of) is a pain. iPad like Macs are closed systems. 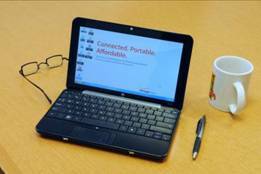 I like the iPad the more I understand its trove of features, but I won’t be giving up my PCs any time soon. Your Apple iPad is in! 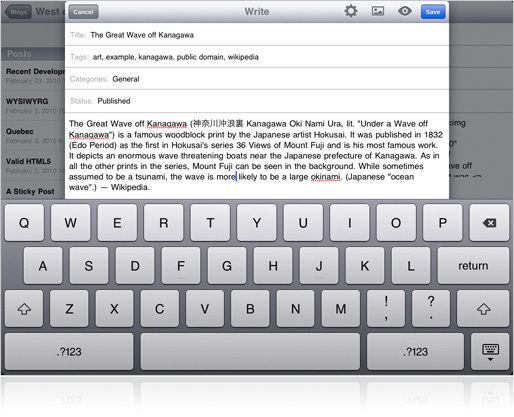 I understand the iPad treats gMail and Google docs as a web-site and won’t present the keyboard for typing. Is that true? Google must have an app by now — doesn’t it?